We explore a computationally efficient method of simulating realistic networks of neurons introduced by Knight, Manin, and Sirovich (1996) in which integrate-and-fire neurons are grouped into large populations of similar neurons. For each population, we form a probability density that represents the distribution of neurons over all possible states. The populations are coupled via stochastic synapses in which the conductance of a neuron is modulated according to the firing rates of its presynaptic populations. The evolution equation for each of these probability densities is a partial differential-integral equation, which we solve numerically. Results obtained for several example networks are tested against conventional computations for groups of individual neurons. We apply this approach to modeling orientation tuning in the visual cortex. Our population density model is based on the recurrent feedback model of a hypercolumn in cat visual cortex of Somers et al. (1995). We simulate the response to oriented flashed bars. As in the Somers model, a weak orientation bias provided by feed-forward lateral geniculate input is transformed by intracortical circuitry into sharper orientation tuning that is independent of stimulus contrast. The population density approach appears to be a viable method for simulating large neural networks. 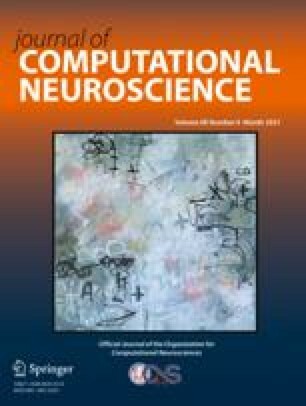 Its computational efficiency overcomes some of the restrictions imposed by computation time in individual neuron simulations, allowing one to build more complex networks and to explore parameter space more easily. The method produces smooth rate functions with one pass of the stimulus and does not require signal averaging. At the same time, this model captures the dynamics of single-neuron activity that are missed in simple firing-rate models.